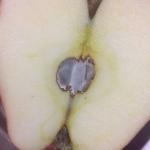 On cutting an apple, i saw a fuzzy white fungus in the central core region of the apple. I took a sample and fixed it on a slide to look under a foldscope. It was a weft of fungal hyphae. I tried to locate the spores, but in vain. The entire apple other-wise had no fungal infection. 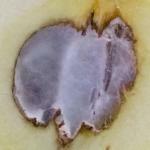 The matter of concern is, how did the fungus grow within the core? Causal organism is not known to me. Can anybody identify it?